is not where I am then. Takes me to my home again. So I do not lose track. A thoughtful verse. I’m not sure about that business of being racked! I’m sorry Beverly. 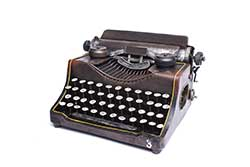 I couldn’t remember how to express a carriage return on the typewriter, lol! I often, long retired lose track of days, as they race along blending together–yet we recall those days when it is our turn in the barrel, right? Thank you Frank, Happy New Year! Thank you Stacy! Happy New Year! I specially like the end destination of home again. Hopefully the final destination is a place well deserved. Thanks Gina, that’s the trick, knowing who we are, lol Happy New Year!!! “Where I was at right now, is not where I am then.” Love this tinkering of past and present. Thank you Mish. I’m always tinkering. Happy New Year😆!!! Maybe it’s moving and always returning that makes the most sense. Thanks Bjorn. I don’t know if I ever make sense , lol Happy New Year!!! I like the sense of time moving backwards and forwards–time and memory fluid, but still somehow grounded. Type the magic (last) word, hear the bell chime, hit the carriage return, and see the return of Walter Marks! Brilliantly written, sir. Of course! Every New Year’s Eve is awesome — wedding anniversary and all. How was yours? TheresT always a party going on somewhere! Hard to forget, too! Nice! I hope the rack of life is not too painful for you! Thanks Dwight. Nah, I think I was already bent. Happy New Year Buddy! !! I love the use of rack to describe the carriage return. The ending rhymes mirror that sound, that ear and tactile candy that registers another line, the bell that conditions us to keep typing. Young uns today don’t get that. Love this!